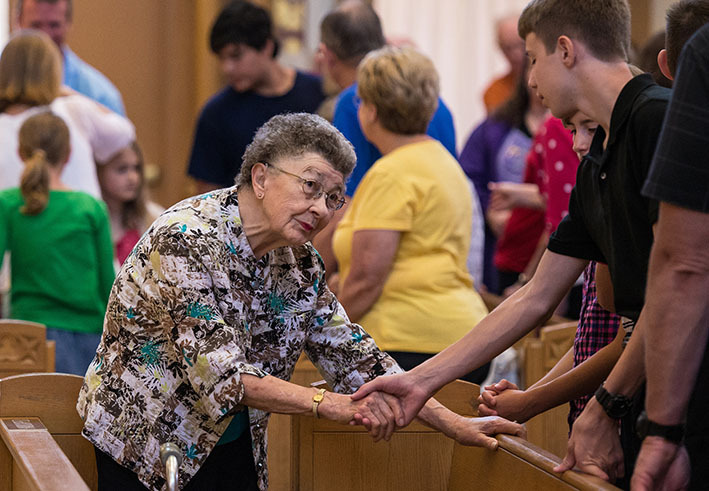 Peace shared: Parishioners sharing the sign of peace at Mass. However, the congregation said, “if it is foreseen that it will not take place properly”, it can be omitted. But when it is used, it must be done with dignity and awareness that it is not a liturgical form of “good morning”, but a witness to the Christian belief that true peace is a gift of Christ’s death and resurrection. The text of the congregation’s “circular letter” on “the ritual expression of the gift of peace at Mass”, was approved by Pope Francis and posted in Spanish on the website of the Spanish bishops’ conference. Vatican spokesman Jesuit Father Federico Lombardi confirmed its authenticity on August 1. Current prefect of the congregation Cardinal Antonio Canizares Llovera and the congregation’s current secretary Archbishop Arthur Roche said Pope Benedict XVI had asked the congregation to study the matter and, after doing so, in 2008 it asked bishops’ conferences around the world whether to keep the sign of peace where it was or move it to another moment “with a view to improving the understanding and carrying out of this gesture”. But that did not exclude the need for new or renewed efforts to explain the importance of the sign of peace so the faithful understood it and participate in it correctly, the congregation’s letter said. It asked bishops to study whether it might be time to find “more appropriate gestures” to replace a sign of peace using “familiar and profane gestures of greeting”. • People using the sign of peace at Christmas, Easter, baptisms, weddings, ordinations and funerals to offer holiday greetings, congratulations or condolences. But in the Latin rite, the letter said, the exchange of peace came after the consecration because it referred to “the ‘paschal kiss’ of the risen Christ present on the altar”. It came just before the breaking of the bread during which “the Lamb of God is implored to gives us his peace”.